Today we're featuring a custom wallpaper design that we produced for an expectant mother and her husband. As a mother to be, she knew she would be spending a lot of her days, and even more of her nights, in the nursery with her daughter. In an effort to liven up the atmosphere for her baby as well as herself, we were commissioned to transform the nursery room into a virtual fairy wonderland using custom wall murals. The mural was designed using a number of stock photo elements and references that were in keeping with the fairy look. Images of little girls were modified to have a painterly look, then wings and light flowing fabrics were added. Throughout the wall mural the fairies appear in unexpected places, from one who is sleeping on an turtle, to another in pure white nestled amongst a flowering dogwood's blossoms. The main challenge of the custom wallpaper installation was creating a look that spanned the full perimeter of the room seamlessly. But the challenge was made entertaining by all of the fanciful snippets we were able to add to the design. The end result is a calm and peaceful space that the whole family, especially baby, will enjoy for years. 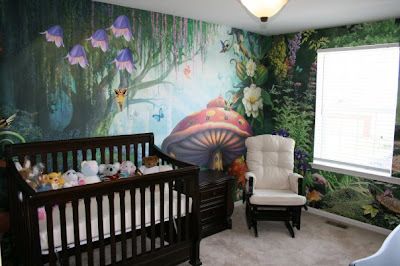 Do you have a nursery you'd like to finish with custom wallpaper? Contact us to learn more.